Geoff is an engineer and multi instrumentalist that has been working with Jason and Central Command Studios since 2011. 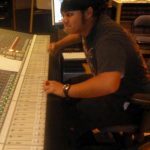 Also as a programmer/composer, he works with artists that come in to help build their tracks from scratch and bring them to life. He is well versed in a wide variety of genres, including Rock, Pop, Country, Rap/Hip-Hop, Electronic, and Heavy Metal. As an ADR engineer, he has worked as head or assistant engineer on many of the video game and anime sessions at Central Command. Geoff is a graduate of the recording program at the Musician’s Institute in Hollywood, CA.